This is designed to enable full vision of the objects in or/outside a closed curtain, whilst providing security and natural light flow. Suitable for shopping centres, clubs, doorways, entrances, book stores, video shelves and food areas. The clearlite roller shutter will be as manufactured by 3rd Generation Doors. 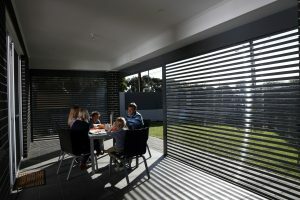 The curtain will be constructed using clear polycarbonate interlocking slats, hinged along an extruded aluminium mid rail and designed to roll up overhead, manually. The curtain will be constructed using a clear polycarbonate extrusion having a face depth of 35mm. Each mid rail will be fitted with specially moulded end clips to stop lateral movement and provide smooth operation within its guides. The bottom rail will be a specially extruded aluminium section measuring 120mm in height by 2mm thick. It will have incorporated within the body of the bottom rail a "mortice" type locking system. Locking will entail a centrally mounted, concealed key operated L & F security type lock mechanism. It will be keyed on the outside and inside, fitted into the bottom rail of the roller grille. The guide channels will be 50mm by 30mm by 2mm thick anodised extruded aluminium and will contain a false back for concealed fixing. (Note: Guide channels can also be fixed "through the face" or by using take up channels). The centre door mullions will be used for wide openings and multiple door installations. The centre door mullions will be manufactured from specially extruded anodised aluminium sections having a minimum width of 125mm by 30mm depth. The mullions will be a lift-out type fitted with shoot bolts locking at the bottom of the mullion. The corner and angle mullions will be used when two grilles meet at a corner The mullion will be manufactured from aluminium sheet formed to suit the angle and size as required. Designed for manual operation as standard. Chain, motorisation or remote control on application. Manufactured to suit any width of opening with the use of removable or fixed mullions. Individual shutters are manufactured up to 3 meters in height or 2.8 meters in width without exceeding 9 square meters. All aluminium sections (mid rail, bottom rail and guide) are natural anodised as standard. A wide range of colour anodising or polyester powder-kote finishes are available when specified. The clearlite polycarbonate panels are available in clear as standard, also, depending on availability other colours may be incorporated. 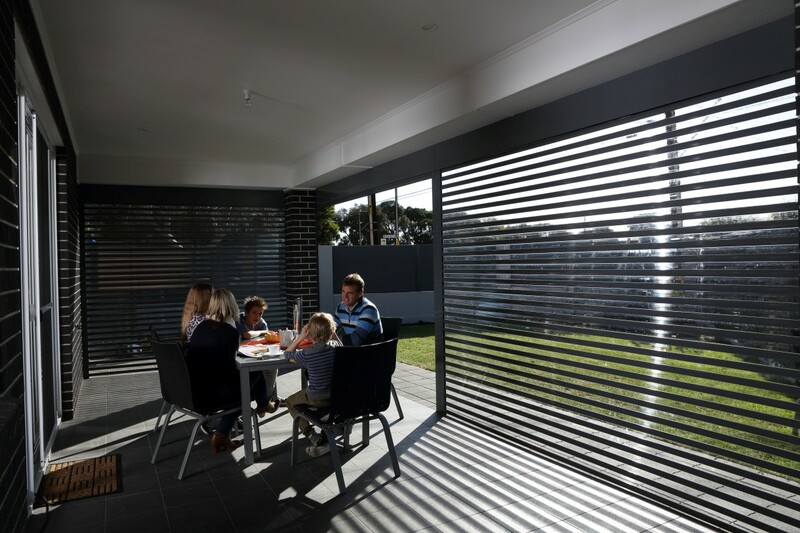 The polycarbonate interlocking slat can be pierced with slots 89mm long and 26mm high at 140mm centres. The roller drum will be manufactured from a 150mm or 200mm diameter spiral ducted tube and will be attached to nylon drum wheels. The roller drum will be fitted with helical torsion springs with a counter balanced mechanism matched to suit grille size and weight. The drum shaft will rotate around a 40mm diameter shaft. The roller drum will be designed to give minimum deflection over the grille span. The grille drum support brackets will be manufactured from either mild steel plate having a minimum thickness of 3mm (between wall fixing) or mild steel angle type brackets (behind wall fixing) to be matched to suit grille size and weight. Fixing will be using masonry anchors and/or hex head bolts or as specified for steel work.